Hola La Bloga readers, today I want to share some curriculum guides developed for my books. You can use these ideas in the classroom or at home. 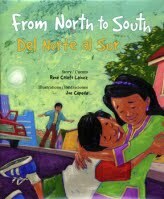 A picture book (suggested for ages 4-8 and older), From North to South/Del Norte al Sur (by Rene Colato Lainez) tells the story of Jose and his Papa, who are going to visit Jose’s mother who is living just across the border in Tijuana, after being arrested at work for not having papers giving her permission to work in the United States. Download the Discussion Guide by Cheryll Wallace for From North to South. Cheryll Wallace is a Religious Education Director at First Unitarian Church of Omaha, former PSD Board member, and leader of the PSD GRACE (Growing Racial And Cultural Equity) Team. Move over, Tooth Fairy! El Ratón Pérez is in town! Most children in the U.S. are familiar with the Tooth Fairy, but children in Spain and Latin America grow up with a different tradition. 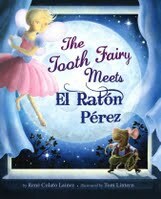 In these regions, an adventurous mouse, El Ratón Pérez, collects children’s lost teeth from their pillows. This curriculum guide was created by LEIGH COURTNEY, Ph.D. She teaches first and second grade in the Global Education program at a public elementary school in San Diego, California. She holds both master’s and doctoral degrees in education, with an emphasis on Curriculum and Instruction. In this charming story, a little boy visits his grandmother in Mexico. 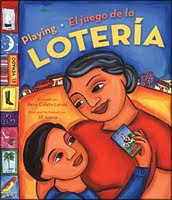 With the help of la lotería, he learns a new language and how special the bond between a boy and his grandmother can be. * Tools for Teachers developed by Luna Rising/ Rising Moon. * Playing Loteria/ El juego de la loteria: Tejas Book Award Activities. For more ideas visit my website www.renecolatolainez.com and click at For Teachers.